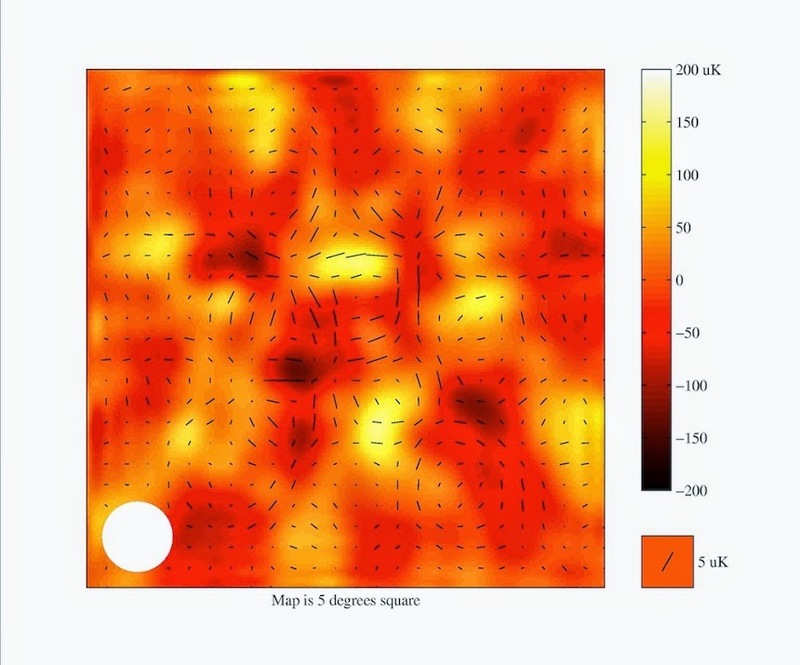 Last year, well before the BICEP2 news, it was announced that researchers at the South Pole Telescope had discovered B-mode polarization in the cosmic microwave background. This was a pretty big deal, but it will take some explaining to understand just why. Let’s start with the idea of polarization. Light waves are a type of wave known as transverse waves. This means their oscillation is perpendicular to their direction of travel. You can see this in water waves, where the up and down motion of the wave is perpendicular to its motion along the water’s surface. With light waves (and electromagnetic waves in general), the vibration is that of the electric and magnetic fields. Because of this, transverse waves can have an orientation to them known as polarization. If you imagine a vibrating string, the waves could move up and down, or side to side, or at some angle. There are other types of polarization that are more complex, but you get the idea. Generally, the light emitted by a hot source is randomly oriented, or “unpolarized”. However if light scatters off a material it can be polarized by the interaction. The atmosphere does this to sunlight a bit, which I’ve written about before. This is why a good pair of polarized sunglasses can eliminate glare. They block light with horizontal polarization, which most reflections have. Polarization happens in scattering when source of light is not uniform. For example, polarized scattering occurs in the atmosphere because sunlight comes from the direction of the Sun, not evenly across the sky. If daylight came equally in all directions, then you wouldn’t see the scattering polarization. So what does this have to do with the cosmic microwave background (CMB)? The CMB is the light from the earliest point where the universe became transparent. 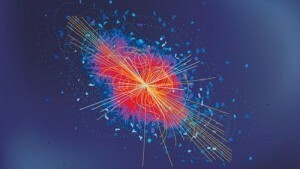 That is, when the universe finally became cool enough for atoms to form. Before that point, the electrons and nuclei were too hot to come together, meaning that they were a thick plasma of charged particles. The light would keep scattering off the charged particles and couldn’t travel freely. In the last moments of this plasma stage, when the electrons finally started to bond with nuclei, the photons created in the big bang would have one last scatter off an electron before making its long journey across the universe. 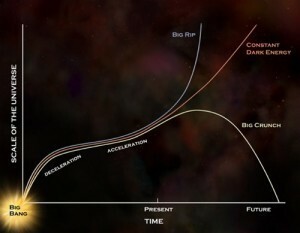 Now if the early universe were perfectly uniform, then we wouldn’t see any polarization from that last scattering. But there were small variations in the early universe, so we would expect to see some polarization in the CMB. Since this last scattering occurred at a particular moment in the early universe, cosmic polarization gives is a precise window into the earliest moments of the big bang. Because of these small variations, the polarization of the CMB varies at different points of the sky. To get an understanding of the structure of the early universe, we need to look at the overall distribution of polarization across the sky. This is where the different “modes” of polarization come in. You can imagine the polarization measurement at each point can be represented by a line, as seen in the figure. Where the lines appear to follow a path, or appear to radiate out from a particular region, then that is known as E-mode polarization. Where the lines appear to twist relative to each other, that is known as B-mode polarization. They are so named because their orientations are similar to those simple electric (E) or magnetic (B) fields. These two modes are important because they have different causes. The E-mode polarization is caused by the variations in density and temperature in the early universe, so it should follow the same pattern as the temperature variations seen in the cosmic background. This was observed in the early 2000s, and the results agreed with the temperature fluctuations as expected. The B-mode polarization has two causes. The first is due to gravitational lensing of the E-mode. The cosmic microwave background we see today has travelled for more than 13 billion years before reaching us. Along its journey some of it has passed close enough to galaxies and the like to be gravitationally lensed. This gravitational lensing twists the polarization a bit, giving some of it a B-mode polarization. It is this polarization that has been observed for the first time. But there is another mechanism for B-mode polarization that is more subtle, and will require more data to observe. This mode is due to gravitational waves produced during the inflationary period of the big bang. You see, the cosmic background only has small fluctuations, and we aren’t sure why. Given the size and age of the universe at that time, its temperature shouldn’t have been able to even out. We think this is because the universe was incredibly tiny in its earliest moments, but soon entered an inflationary period where the observable universe expanded at a furious pace. This would explain not only the evenness of the cosmic background, but also why the universe is flat. But we’ve never seen direct evidence of this inflationary period. If the inflationary period occurred, then it would have produced gravitational waves on a cosmic scale. Just as the gravitational lensing produces B-mode polarization, the gravitational waves would produce a B-mode effect. If we can observe this subtle B-mode, then we will have direct evidence of the inflationary period. This result marked the first observation of B-mode polarization, which is a fingerprint of the matter distribution in the universe. It also opens the possibility to the study of the inflationary period, or to discover that inflation is not the solution. With B-mode polarization we may be able to peer beyond the veil of the cosmic background. so does that mean that matter collected where the dark matter had started to form because of Dark Matters gravitational pull? It does mean that dark matter tends to gravitate together, which is part of the reason we observe the clustering of galaxies. I thought that the universe was “believed” to be flat but is more like a sphere and that we live on the surface but it is so wide that it looks to us that it is flat? but if all the matter in the universe was condensed in a single point, and then exploded and expanded immensely during the inlatory period. wouldn’t it mean, that the universe must be homogeneous and uniform in all directions?